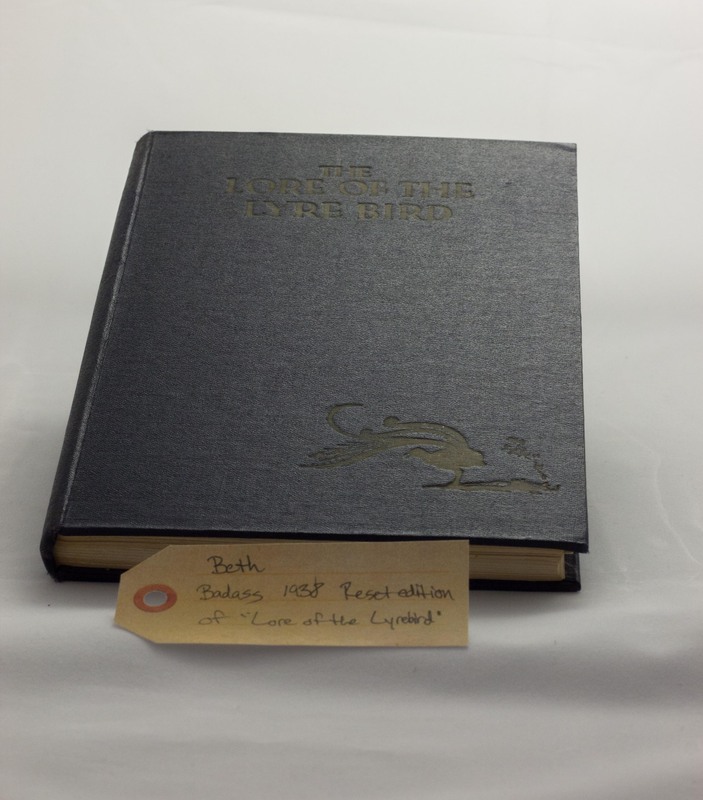 Badass 1938 reset edition of “Lore of the Lyrebird” | That Belongs in a Museum! The Lyrebird a rare Australian bird, it’s kind of secretive. It makes everything from chainsaw noises to other birds’ calls in addition to its own. In the 30’s some zoologist decided he wanted to study them and instead of going and hanging out in the woods and going camping and just roughing it, he encouraged one to come and hang out at his house, and he named it and did a bunch of other really improper things. He basically ended up with this bird that would only come over when he was home, when he would go to other countries to study other birds, it would just go away and check to see if he came back every few days. The book is really beautiful, it has engravings and tipped in glossy photographs that are two to a page. […] The book just generally feels and smells really awesome because it’s from 1938. It was reset. The 1937 edition was horrible, like nobody paid any attention printing it. So they reset it for the 1938. […] I got it from Amaranth in Evanston.